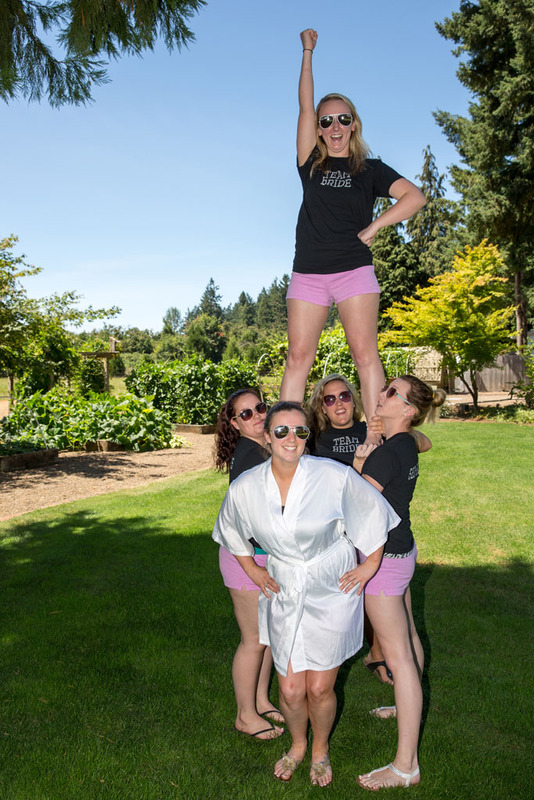 This image is from another Oregon vineyard wedding, at King Estate. While King Estate no longer offers wedding venue services, it’s still a fantastic place for lunch or dinner and they make great Pinot. Also, they still let me use their property for taking photographs; it’s an excellent place for engagement photos! As I’ve stated in previous posts, I normally use some form of flash in my portrait photography: it just helps images look more natural, ironically enough (the use of fill-flash replicates how our eyes actually see things). However, there are some instances where the use of flash is simply not necessary. This is one such instance. The sun was just setting behind the newlyweds and I really liked how the light flared out behind them. Using fill flash would have taken away some of that contrast which, in this case, I wanted to show. Oregon’s Willamette Valley is loaded with amazing vineyards, and most have wedding venue facilities. Each has its own unique atmosphere and all offer wonderful photographic opportunities. This image was taken at Sylvan Ridge, located in between Eugene and Cottage Grove. The sun had just gone down and all that remained was golden light, without any shadows. In other words, my favorite time of day for wedding photography! Eugene has so many places for great wedding photography, it’s hard to pick a single favorite. One of those favorites has to be Hendricks Park. Filled with wandering paths and incredible trees, Hendricks Park is a great place for engagement photos, too. If you’re shooting a wedding in Eugene, and the venue itself isn’t as spectacular as you’d like it, head to Hendricks Park! This couple got married elsewhere in Eugene but wanted some ‘great outdoor shots’ for their album. The late summer sun had nearly set by the time we arrived and the light was all soft and golden. This image was taken towards the end of the shoot, when the bride and groom were ready for a little rest (I always try and incorporate some sitting and lying-down photos, if only to give the newlyweds a break!). This bride and her bridesmaid were all cheerleaders together in high school. I was amazed how fast the Maid of Honor was able to leap up to the top here! Picking out the bridal dress is one of the most important decisions a bride has to make. Backless? Lace? Veil? After spending so much time (and money!) on the perfect dress, it’s only natural that when the groom sees his new bride for the first time, in her dress, it’s a very special moment. Whether or not this first look happens before the ceremony or when the bride walks down the aisle, the buildup to that moment is awesome.